Recoil and velocity have huge influences on handgun zeroing and even ammo selection. On both targets, the top group is a 300-grain load, the bottom group a 180-grain--both fired with same sight setting. Impacts for the lightweight .44 (l.) and the all-steel .44 differ by more than six inches at just 25 yards. Among shooters it is generally known that fast, lightweight bullets have flatter trajectories than slower, heavier bullets. They don't drop as much before they reach the same distant target. This is due to fact their higher initial velocity allows them to reach the target more quickly than slower bullets, so that gravity has less time to pull them down, and also because lighter bullets typically have more streamlined design, which allows them fly more efficiently with less susceptibility to air resistance than heavier bullets, which are typically more blunt-nosed and less aerodynamic. Now when a rifle shooter zeroes his gun to be dead on, say, at 150 yards with a fast light-bullet load, and then shoots it at the same target with a slower heavy-bullet load, the heavier load will hit lower on the target. 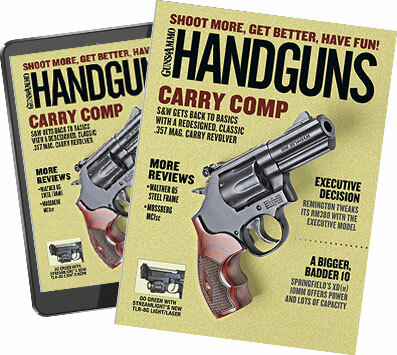 But now consider a handgunner who has sighted his .357 Magnum revolver to be dead-on at 50 feet or 25 yards with fast 110-grain JHP ammunition and then shoots it at the same target with a heavier, slower-velocity 158-grain or 180-grain load and discovers the heavier load actually hits higher on the target instead of lower. Huh? That can't be right. It's slower, so it should be lower, right? What's making this happen? The answer, in a word, is recoil. Recoil begins at the instant the cartridge propellant begins to ignite, generating energy that simultaneously pushes backward against the gun in the shooter's grasp and pushes the bullet down the bore. Recoil begins before the bullet leaves the bore, and the gun is therefore already moving backward in recoil while the bullet is still in the bore. Heavy-bullet loads typically generate more recoil energy than light-bullet loads, meaning there is more muzzle rise before the bullet leaves the bore with a heavy-bullet load than with a light-bullet load, so the muzzle is pointing at a more upward angle at the moment of exit with the heavy-bullet load. This is why, with conventional handguns fired at conventional handgun distances, heavy-bullet loads typically hit higher than light-bullet loads when fired from the same gun at the same target. Actually, there is a "crossover point" somewhere downrange where the effects of gravity and air resistance counteract the recoil effect and begin to pull the heavier bullet's trajectory below the faster, "flatter-shooting" bullet. But with conventional handguns at ranges closer than 50 yards, this is not usually observable. The phenomenon is technically termed "bore-transit recoil" (or "in-barrel recoil"), and it can have significant and sometimes disconcerting effects for handgunners using many of today's popular sporting and personal-defense pistols and revolvers. There are a lot of interacting variables. Shorter-barrel guns have less bore-transit recoil, although the extra weight of the longer gun may moderate the muzzle rise, resulting in similar points of impact. It is important to understand that the practical, real-world effects of bore-transit recoil for a handgun shooter have little to do with a cartridge's absolute recoil energy, which is mathematically calculated via a complex formula involving the projectile's mass times its velocity added to the mass of the escaping gases, burnt propellant, unburnt propellant and other gases, times their respective velocities. The absolute recoil energy of a cartridge is the same whether it is fired in a 15-pound benchrest rifle or a 15-ounce ultra-lightweight pocket pistol. For the handgunner, the important thing is rather how his gun reacts to this energy during the time the bullet is moving down the bore--and how he reacts to his gun's reaction. In terms of the gun, the amount of muzzle movement during bore-transit recoil is determined primarily by bullet mass, bullet velocity, gun weight, barrel length and the rifling twist rate and direction. The mass of the bullet determines its inertial resistance to being moved forward down the bore; bullets with greater mass take longer to get started and are therefore in the bore longer, giving the muzzle more time to move. Heavy-bullet loads generate significantly more bore-transit recoil than light-bullet loads. L.-r.: .357 Magnum 110-grain and 200-grain, .44 Magnum 180-grain and 300-grain. Bullet velocity also determines how long the bullet is in the bore before exiting; faster bullets get out before the muzzle has as much time to move. The weight of the gun determines its inertial resistance to being moved backward in the shooter's hand; heavier guns move less before the bullet exits. Barrel length also determines how long the bullet is in the bore before exiting and also relates to the overall weight of the gun. Rifling twist rate and direction determines how much the muzzle will "torque" (i.e., rotate laterally in the shooter's grasp) while the bullet is in the bore; heavy bullets generate more torque because of their greater inertial resistance to being spun. In terms of the handgun shooter himself, the degree to which bore-transit recoil for his particular gun/load combination will show up on target depends on the strength and stability of his grasp on the gun, and the consistency (or variation) in his grasp from shot to shot. A shooter with a firm strong grip on the gun reduces its movement and will see less on-target effect from bore-transit recoil than a shooter with a loose, relaxed grip on the same gun/load. And, of course, if you don't grasp the gun consistently for every shot, it will move differently on every shot, anyway. Since all handgun shooters' styles of holding their guns are entirely individual, the effects of bore-transit recoil are truly individual for all shooters. bore-transit recoil, which is why they hit lower on target than heavier bullet loads at handgun-close distances. Also, short-barrel guns generally produce less bore-transit recoil movement than do longer-barrel guns. This may contradict your common-sense impression that a lightweight snubnose revolver jumps more in your hand than a six-inch sport revolver. Yes, it does. But most of that recoil movement occurs after the bullet has left the muzzle. So how significant is all this? Here's an example. For many years I carried a stainless-steel four-inch S&W Model 629 .44 Magnum (weighing 42 ounces) loaded with SAAMI-spec 300-grain hard lead ammunition as a backcountry "bear-attack" sidearm, sighted dead-on at 25 yards. Loaded with SAAMI-spec 180-grain JHP .44 Magnum ammo, it printed about six inches low with the same sight setting at the same distance, entirely due to the effect of bore-transit recoil (and you can really feel the recoil difference between those two loads). But after S&W introduced its ultra-lightweight four-inch Model 329PD scandium alloy frame .44 Magnum, weighing only 26 ounces, I switched for the much more comfortable carry, knowing that if I ever really did need to unload it up close in a grizzly's face, I wouldn't even notice the (significant) added recoil of the much lighter gun. Front blades on ultra-lightweight handguns are typically higher than blades on all-steel guns to allow for greater bore-transit recoil. I sighted it in at 25 yards with the 300-grain load, just like the heavier Model 629. Then last year I had the opportunity to go on a handgun cougar hunt, and decided the Model 329 would be a perfect lightweight tool. So I went to resight it with 180-grain JHPs. At 25 yards the point of impact was 13 inches below the point of impact for the 300-grain load. Cutting the weight of the gun nearly in half more than doubled the bore-transit recoil effect between the heaviest and lightest available commercial ammunition. Disconcerting? Well, yes, since it was impossible to raise the factory-standard adjustable rear sight far enough to get any closer than four inches from the point of impact, and there was no way to file down the M329's Hi-Viz fiber-optic front sight. Some ultra-lightweight revolvers cannot be zeroed for fast, light-bullet ammunition-even with the rear sight elevated completely out of its channel. Fortunately, S&W (and several aftermarket sightmakers) offer different-height replacement S&W rear sight leafs, and by installing the highest rear leaf available, plus replacing the fiber-optic front blade with a lower-profile plain blade, I was able to bring the gun to zero with the 180-grain ammo (although the 300-grain loads are now beyond this setup's adjustment range). The point of this example is to illustrate the extremes you might encounter in terms of bore-transit recoil effects, even with handguns of the same caliber, configuration and barrel length--particularly today when handgun manufacturers are offering many different versions of the same-size gun in a much wider range of weights and constructions. Even within S&W's renowned small-frame "Chiefs Special" family, there are two-inch steel.357 Magnum models and same-dimension alloy-frame versions that are half the weight. Believe me, the bore-transit recoil effects in these guns are not the same. Handgun manufacturers generally set the sight specifications of their products for "typical" ammo loads in that caliber. However, in many cases these sight configurations may not reflect all the different weights (and consequent different bore-transit recoil effects) in which the same basic gun may be available, nor allow for all the different bullet-weights and power levels of ammunition for which they are chambered. Generally speaking, front sight blades on extreme lightweight revolvers are notably higher than the front sights on their all-steel counterparts, to allow for the increased bore-transit recoil (and consequent higher bullet impact) when heavy loads are fired in the lighter guns. But this may make it impossible to zero the lighter guns with faster light-bullet loads. If the gun has adjustable sights, you may have enough leeway to compensate for the recoil differences among loads that fall within the sights' adjustment range (but not always enough, as my Model 629/Model 329 experience illustrates). Some guns, particularly those that are chambered to shoot ammunition with extremely different levels of power or velocity, are even being sold these days with two different rear sight assemblies to allow you to match the sight to the ammo. For example, S&W's massive X-frame Model 460V comes with an installed rear sight for shooting either .460 Magnum high-velocity 200-grain loads or milder/slower .45 Colt ammunition, and also an accessory lower rear sight for shooting .454 Casull ammunition or heavy-bullet .460 Magnum loads (which generate more bore-transit recoil). If the gun has fixed sights, you are much more limited. With auto pistols featuring dovetail "fixed" rear (and/or front) sights, you can often replace either (or both) with different heights to accommodate different loads. With fixed-sight revolvers employing rear sight notches milled into the frame and low-profile integral front blades, there's nothing much you can do except choose an ammo load that matches the gun. An excessively high pinned front blade can be replaced by an aftermarket steel or polymer blade, which can be filed to proper height. If you buy a snubnose .38 Special revolver, for example, regardless of its weight (steel or alloy), start by trying the most common and popular current .38 Special ammo available to see where it shoots at the distance you expect to use it. If you can't find one that shoots to point of aim where you want, get in touch with the gun manufacturer and ask what ammunition they actually spec'd the thing with, at what distance. Unfortunately, most gun makers don't bother to provide that information in their catalogs or instruction manuals. ess with your handgun. It seems counterintuitive to conventional understanding of light-bullet and heavy-bullet trajectories, even though the same holds true with rifles. It's just not as apparent with a shoulder-fired arm engaging targets at greater distances, due to the fact that handguns are fired unsupported, at generally much closer targets, and move more abruptly in response to recoil effects.